Everyone always says the only way to truly appreciate tea is to visit its place of origin. 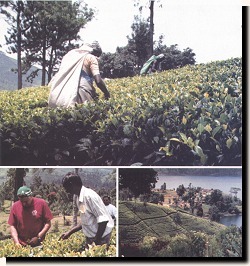 David DeCandia of the Coffee Bean & Tea Leaf traveled to Sri Lanka to immerse himself in the world of Ceylon Tea and shares his experience with Tea & Coffee Trade Journal. Having routinely tasted many Ceylon teas from various estates in Sri Lanka, I couldn’t wait to actually visit and see, with my own eyes, the origin of these great black teas. Once arriving in Colombo, Sri Lanka, after a long flight from California, I realized that I was only at the beginning of an exciting journey. Just a mere three and a half-hours after arrival, I arrived at the Bogawantalawa Estate Valley. As one could imagine, the landscape of waterfalls, luscious green vegetation and fruit bearing trees were in abundance. I finally reached the Bogawantalawa Estate Summerville guest bungalow. Upon my arrival Angelo Wickramasuriya, vice president of marketing at Bogawantalawa Estates and Sanje Widyarante, c.e.o, of Walters Bay, Bogawantalawa’s North American office, greeted me. The fact that they have an office in the U.S. has made communication with the estate even better. Camellia sinensis plants at an elevation of 5,000 ft surrounded the bungalow. The bungalow itself took us back to the old style of British planters with old fireplaces and polished hardwood floors with sprawling verandahs. The first matter at hand was having a great cup of tea overlooking the mesmerizing Castle Reigh Lake with the Bogawantalawa highland mountains in its back drop. After settling in, we rested and woke up at 3:00 the next morning for a lesson in the orthodox processing of tea at the Norwood Estate. Wickramasuriya, who had started working in the gardens at a young age, showed me various stages of tea at different lengths of oxidation. 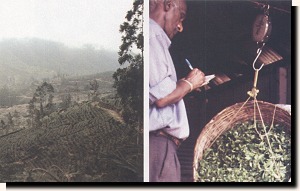 Wickramasuriya had planted many of the fields in the Bogawantalawa valley and knows tea inside out from the seed to the cup. The varied oxidation times were very visible to the eye. The teas that were oxidized longer had a dark brown tint to them while the leaves with a shorter oxidation were more of a light brown. The beauty of this whole process is that the transformation from a just plucked leaf to a fired leaf cannot wait and must be held to the strictest guidelines. To ensure consistency and quality, Widyarante and I talked about the details in wet bulb and dry bulb temperature differentials, drying durations and how the grading of these special teas are done. After returning to the bungalow at about 5:00am we sat down to a fantastic cup of Ceylon OP1 from Norwood Estate. Once the sun started to rise, we were ready to head out to the Loinorn Estate for a full day of harvesting the morning pluck leaf. Because of the relationship between Walters Bay Bogawantalawa North America and Coffee Bean & Tea Leaf, we have been able to develop a fantastic OP1 morning pluck leaf that rivals no other. Each time I set foot in a tea garden and see all those pluckers (mostly women) with their beautifully colored saris and the sun starting to lightly shine on the bushes, I feel closer to the experience of tea than at any other time. Plucking two leaves and a bud is never an easy task. Yet these workers make plucking seem extremely easy. Even when they’re climbing at awkward angles, they manage to continue plucking without missing a step. There is an incredible rhythm to plucking and it’s amazing to see all the workers in what seems like choreographed dance. For me, harvesting was a way to become even closer to the beverage I love. However, since it would take me a week to fill my basket, I don’t think I have a future in plucking leaves. 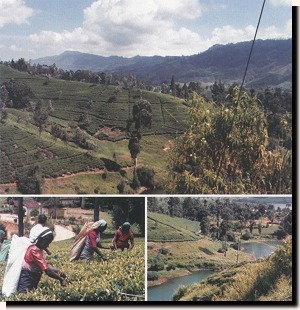 The importance of visiting origin to watch the process your tea goes through cannot be measured. Plucking, withering, rolling, screening, oxidizing, drying, sorting, packing, are all fundamental to delivering the best tasting cup of tea. Later that day we visited Bogawantalawa’s Wanaraja and Kotiyagala Garden marks to cup CTC teas. Cupping brings out the differences among CTC garden marks themselves. It helps you realize the impact of location of tea bushes and the variations of clonal tea leaves. Each sub division produced a unique cup from different clonal leaves with truly impressive flavor profiles. I visited one of the 10 schools with neat classrooms and children in white uniforms who were learning English from their teacher. Every class had a trained teacher and each school had a principal. There were 27 day care centers to look after the infants and toddlers while the mothers were at work. There were six hospitals and two maternity clinics with a full time medical staff. All housing was local and new buildings were being constructedwhile I was there. The Bogawantalawa Estate has 23 sub estates, 11 factories, 16,500 workers and 45,000 acres. Sri Lanka not only has great tea but the country has a uniqueness and goodness which I was fortunate to see. On a day when we were not cupping tea, we drove to see the Elephant orphanage in Pinnewalle, Sri Lanka. The trip there was not without color especially on Kandy road where miles and miles of cashew girls (Kajugama) were selling organic cashews. Let me tell you they tasted great and the price couldn’t be beat. Once we arrived at the elephant orphanage, we approached a building that had a place to eat with a balcony attached to it. Once I reached the balcony I couldn’t believe how many orphaned elephants were walking and playing in the water. Hundreds of elephants from babies to full grown; all of these elephants would have died if they were not brought in to the orphanage. It was great to actually touch the elephants and know that they are being cared for. Talking to the workers and learning the more efficient way to pluck leaves was exciting as well as difficult. More importantly the lesson was a way of connecting. There is an automatic connection between those that take pride in their production of tea and those who can appreciate its quality. To watch the faces of the supervisors of the factory while I cupped the tea was a feeling of connecting. They are very proud to produce such a wonderful drink. Even if you are an expert at cupping you realize that you can always learn more. Cupping tea at origin whether the tea is just plucked or months old is a completely different experience than cupping in your own cupping room. To learn that the moon itself can play a part in a teas quality cannot be taken lightly from someone who has been doing it for thirty years. To realize that the outside temperature is so important when processing the tea in the factory. You cannot make this trip as just a tea buyer or taster, but you have to open yourself to all the possibilities which make tea what it is. It is definitely not only your textbook knowledge but your passion that makes you a good tea taster.